Philadelphia fans can’t catch a break in terms of public perception. Lots of incidents come to mind; in Baltimore the most egregious offense involved a Philadelphia resident pushing the Oriole Bird off the outfield wall at Camden Yards in 1999 causing the mascot to break his ankle. Now it appears Philadelphia’s mascot also has a public perception problem. The Phillie Phanatic is being sued. Though the club takes issue with the title, the Phanatic is being referred to as “the most-sued mascot in sports” thanks to a 2001-2002 Cardozo Law Review article by law professor Robert Jarvis. This isn’t an effort to pile on fans from the City of Brotherly Love. Rather, like any good journalist would do, I want to localize the story. 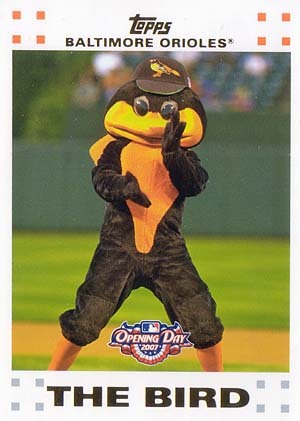 I tracked down Jarvis’ article, “Hi-Jinks at the Ballpark: Costumed Mascots in the Major Leagues,” to read what he had to say about the Oriole Bird. All I can say in response to what I read is Tsk-Tsk Juan Samuel. Jarvis notes “The actors who have played the Bird have been a particularly litigation-prone group” and cites this incident involving O’s interim manager Juan Samuel. Check out Jarvis’ full article for details about the Bird losing the tip of a finger during a game with the Red Sox, injuring his leg after a victory celebration fall from the dugout roof, and having his feathers ruffled by a drunk off-duty cop. And all these years I thought it was just bitterness about the '83 Series that made Samuel send runner after runner to get cut down at the plate. Don't let the happy-go-lucky front fool you. The guy may seem cheerful in those post-game pressers, but he clearly has it out for the Orioles.